From the Project Overview: "Professional genealogists have recognized the importance of these atlases for many years. Although some of these atlases were reprinted during the 1970s, the fact is that many of these reprints are becoming as rare as the originals. McGill's Rare Books and Special Collections Division is fortunate in owning copies of many of the original atlases. Begun in July 1998, the County Atlas pilot project initially encompassed ten atlases. Two subsequent Phases allowed the completion of the Ontario map, ultimately totalling forty-three atlases. The County Atlas Digital Project is a searchable database of the property owners' names which appear on the township maps in the county atlases. Township maps, portraits and properties have been scanned, with links from the property owners' names in the database." Geographic Township is a polygon feature that indicates the fundamental land subdivision fabric of the Province. Each Geographic Township area may or may not be the same as the jurisdictional area of the township. 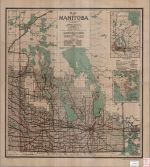 The location of township lines on the Ontario Base Maps (OBM) were determined by using a combination of both survey information, i.e., retracements, original township plans, surveys notes, etc. ; and OBM physical features such as roads, trails, fence lines, and water bodies. In some areas where there were almost no OBM physical features available, aerial photographs may have been used to help determine boundaries. Unorganized areas are derived from Ontario Ministry of Natural Resources Base Map Areas. Data are available in ArcView� 3.x format.